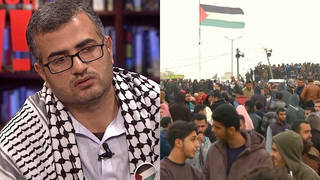 Palestinian Journalist Remembers Israel’s Assault on Gaza | Democracy Now! AMY GOODMAN: One year ago this weekend, Israel began its twenty-two-day assault on the Gaza Strip. Dubbed “Operation Cast Lead,” 1,400 Palestinians and thirteen Israelis were killed in what was Israel’s deadliest attack on Palestinians. As protests were held around the world to mark the first anniversary of the assault, the Egyptian government is blocking solidarity activists from entering Gaza to take part in the Gaza Freedom March. On Sunday, Egyptian security forces detained two groups of international activists who were preparing to join the march. Meanwhile, Egyptian authorities have also held up a humanitarian aid convoy led by British lawmaker George Galloway. As we look back on Operation Cast Lead, we turn to Palestinian journalist Sami Abu Salem, who was in Gaza during the assault. With the borders sealed, international journalists could not enter Gaza, and the world relied on the work of Palestinian journalists like Sami and Al Jazeera, the only international network that was already in Gaza before the military operation began. Democracy Now! producer Anjali Kamat traveled to Gaza in March of this year. She met Sami Abu Salem in his home in the Jabalia refugee camp. He recalled the first day of the bombings, which began with coordinated air strikes by sixty war planes across the Gaza Strip, killing over 300 people, including 238 police officers, in a single day. SAMI ABU SALEM: On the first day of the war, in the morning, 9:00, 10:00, I started to hear a very huge bombing. OK, I would like just to open the window to see what is going on. Another bombing, another bombing. Tens of bombing happened in this area. I could not find the office, but this is journalism. I directly went to the office and spent twenty days in the office. Just one time, I infiltrated here to bring some bread for my family here. This is the first day. While I am in the car, moving in the car and the streets, people — lots of panic in the streets. People are running here and here, and lots of cars are going to hospitals, and lots of ambulances. Billows of smoke in the sky. It was like a dream, like movie, like on a movie. I was in the car, and I don’t believe what is going on. I, myself, I expected that any building behind my car will be bombed, so I will die. This is our work in Gaza. This is the first day, what I remember. I think we were waiting that the war should be end as soon as possible, because what we saw is indescribable, incredible, about the pictures of children and families who are being killed. We were waiting the war to be end, because — to end the killing. This is the point, not because we felt fed up. We — I think because — we didn’t feel fed up or despair, because we felt ourselves like we are a part of this war and we are the strongest weapon the Palestinians have inside the Gaza Strip. There is something inside you, more than a journalist, like a human — some human cannon is pushing you to work more and more. This — it was a challenge. And how, for example, the cameramen on side the roof, and they see bombing around them, but they don’t leave their roof. Why? This is — I don’t know how to describe it, something I cannot describe it. We were working — not working to cover news; we were working — I feel that when I carry the camera, for example, or to write something, I feel that I’m fighting. This is our weapon. They have F-16s, Merkava tanks and very high-tech technological weapons. And we have our will, and we have our cameras. AMY GOODMAN: Palestinian journalist Sami Abu Salem describing Israel’s twenty-two-day assault on the Gaza Strip that began one year ago this weekend. He was speaking with Democracy Now!’s Anjali Kamat and Big Noise Film’s Jacquie Soohen at his home in the Jabalia refugee camp last March.